We specialise in the web-based applications. We design and develop thin-client applications that are platform neutral, requires no client-side installation and compatible with all modern browsers. Our centralised application server implementation model made for rapid intranet (LAN) or extranet (WAN) deployment. ASAP-CAS is specially designed for Architectural, Engineering and Construction projects. It manages the issuing and tracking of the project directions and progress payments in accordance to NZ regulatory standards. ASAP-CAS manages among others, projects, contracts, contract directions, meeting minutes and progress payments. ASAP-CAS supports multiple configurable regulatory standards, multiple printing stationery and layered access controls. ASAP-DFS is an document repository designed for sharing files and other information among a group of users. ASAP-DFS present directory folder like structures that hold various types of files and data. Access logs are maintained for changes and file uploading and downloading. While ASAP-DFS is designed as a standalone system, it can also be a component module for other systems such as ASAP-CAS. 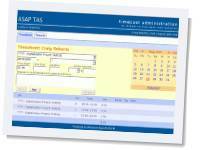 ASAP-TAS is a simple Timesheet entry and cost management system designed for small to medium sized establishments. 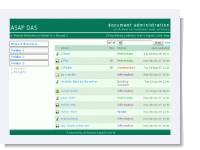 ASAP-TAS features a clean & effective timesheet entry interface. It also contains extensive set of reports including project job cost/budget analysis and staff performance analysis. Optional module will also allows ASAP-TAS to do invoices, statements and aging reports.